It’s one thing to meet the love of your life. It’s another to do it in a quirkily adorable comic fashion ripe for the Hollywood treatment. “Meet-cute” is a screenwriting term used to describe a theatrically manufactured situation that brings characters together in an entertaining, unusual, and perhaps even cosmically determined (or so it is implied) way. Think of it this way: If you met your significant other online, fortuitous as it may have been, that’s a meeting. But if you met your significant other at a cheese counter, both of you pointing to the remaining wedge of brie, which you then decided to buy and share, that’s a meet-cute. A meet-cute can drive your plot all the way to a wedding, officiated by the cheese guy, of course, if you let it. Director Billy Wilder explained the term in an interview with The Paris Review in 1996, describing his 1938 screwball comedy, Bluebeard’s Eighth Wife. In that movie, characters played by Gary Cooper and Claudette Colbert meet when Cooper goes to a department store looking for a pajama top. He doesn’t want to spend money on the bottoms, because he never wears them; Colbert ends up at the same counter shopping for her father, who only wears the pajama pants—and the rest is history. Wilder, who kept dozens of meet-cute ideas in a notebook, called the technique “a staple of romantic comedies back then,” but that doesn’t mean meet-cutes have lost their appeal. Here are 11 romantic pairings throughout history whose first glimpses could have been the stuff of film. Olivia's younger brother, Charles, met Clemens onboard a boat called the Quaker City in 1867. 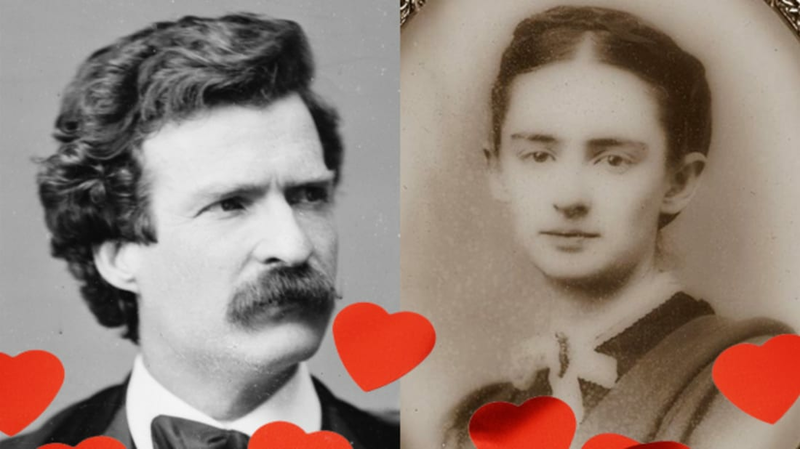 It’s said that on that cruise, Charles showed Clemens a miniature painting of his sister, and the man who’d become famous writing as Mark Twain fell in love with her instantly. When they got back to New York, Sam and Olivia finally met in person when he dined with her family. A few days later, he went to visit her and stayed for 12 hours (during an era when 15 minutes was the socially accepted standard for calling on a lady friend). They soon had their "first date," which—of course—was at a reading by Charles Dickens. In 1903, as she watered flowers outside of the Clarke School for the Deaf in Northampton, Massachusetts, where she worked as a lip reading instructor, something caught Grace Goodhue's eye. There was a window open in the boardinghouse across the way, and through it, she noticed a man standing in front of a mirror shaving, clad in long underwear and a hat. Her laughter got the attention of Calvin Coolidge, who tipped his hat and kept shaving. After a more “formal” introduction—and despite the efforts of her mother, who tried to prevent the wedding—the first-couple-to-be would marry in the fall of 1905. The Beatle attended a preview of Ono’s art show the night before it opened, and he was intrigued by one piece in particular: a ladder leading to a painting mounted to the ceiling, which “looked like a black canvas with a chain with a spyglass hanging on the end of it.” He climbed the ladder, looked through the spyglass, and saw, in tiny letters, the word “yes,” which he felt was a good omen. However, when the two were introduced, Yoko had only heard of Ringo (ouch). Not everyone can claim to have been introduced to their significant other by Elvis, but that’s who led June Carter to Johnny Cash. Elvis and June (with The Carter Family) were on tour, and one day Elvis was trying to tune his guitar while singing, "A-ummm." When June asked what he was doing, Elvis said, "I’m trying to sing like Johnny Cash." When June confessed that she didn't know who that was, Elvis replied, "Oh you’ll know Cash. The whole world will know Johnny Cash. He’s a friend of mine." For the rest of the tour, Elvis would play Johnny Cash songs on jukeboxes throughout their travels. Later, after that tour, Carter was backstage at the Grand Ole Opry, tuning her guitar and singing "A-ummm" like Elvis imitating his friend Johnny. When she looked up she saw Cash himself standing there. She wrote of that moment: “Johnny Cash took me by the hand and said, 'I've always wanted to meet you.' The strangest feeling came over me. I was afraid to look him in the eyes. It was one of the things I did best. I never stammered and still found myself not able to say much of anything.” Thirteen years later, they’d marry. Carville, a staunch Democrat who strategized the presidential campaign of Bill Clinton, would seem like an odd match for Mary Matalin, a conservative Republican who served as deputy campaign manager for political operations on George H.W. Bush's reelection campaign. The bipartisan duo eventually fell in love, and, according to Matalin’s retelling, it started when they met in a bar, drank a lot, and he poked fun at her “Republican bun” hair. The actress and the Virgin Galactic executive (and nephew of Sir Richard Branson) first met while vacationing in a group of 20, including their own significant others at the time, at Branson’s mansion on Necker Island. It must have been lovely… until the house caught fire and everyone had to evacuate. Winslet helped carry Rocknroll’s 90-year-old mom to safety, which clearly made an impression. In 2006, Teigen, then a catalog model, starred in Legend’s video for his single, “Stereo.” Meeting on the set is par for the course for a singer and a model, but afterward, she walked into his dressing room and found him ironing in his underwear. “I said, ‘You do your own ironing! ?’” she told Cosmopolitan. “He said, ‘Of course I do.’ I gave him a hug.” And then they went out for burgers. They officially started dating the next year. The story has long been repeated that Kate and Wills met at St. Andrews University while studying art history in 2001—William paid £200 for a prime seat at a charity fashion show in which she was modeling, a pretty good meet-cute taken advantage of by many a royal documentary. But according to biographer Katie Nicholl, who wrote Kate: The Future Queen, the two actually met in the summer of 1999 through friends, which may have led to Kate’s decision to attend St. Andrews instead of her first-choice Edinburgh. An even sneakier meet-cute! The president and the first lady met in 1989 while they were working at the law firm Sidley & Austin, where he was a summer associate and she an associate assigned as his mentor. (At 25, Michelle had just told her mom she was planning to focus on her career and forget about dating for a while; it always happens when you least expect it!) In an interview, she remembered “hearing his ‘strange name’” and thinking “any black guy who spent his formative years on an island had to be a little nerdy, a little strange." But after the two had a business lunch and attended a community organization meeting together, a date to Spike Lee’s Do the Right Thing followed… and in October of 1992, they would marry.